1/27/2009 HorrorBid inducts Lee Romaire's Second Stab into the Collectors Hall of Fame. if this picture below doesn't make you say the line...."the blackest eyes, the Devil's eyes!" then nothing will! 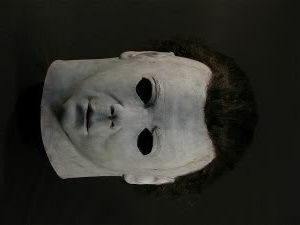 Congratulations, our first Michael Myers mask makes it into the Hall of Fame! LOL...congrats I actually found out about this on "the new horrorbid.com"
Who's the guy who voted no for it?? ?